Public Training is in-depth training deliver by 168Solution as a specialized Contact Center Training and Consulting resources. 168Solution is providing training that open for public with various topics and related with services & quality for Contact Center Professional Practitioners. Now-days companies are aware for the needs of training as an effective way to improve performance and productivity of their employees and ensure they have the skills that suit your business needs. To fulfill that need, 168Solution also provide in-house training program with topics based on the needs of company in which area they are willing to improve. In-house training is a training program for learning opportunities developed by 168Solution. Training may be required to be provided to employees as part of developing their skills and knowledge requirements. To provide and meet customer business objectives, 168Solution will be carrying out training needs analysis. Training needs analysis is a systematic way to investigate your business training needs, provide training recommendation and other training related decision (to improve your business growth). 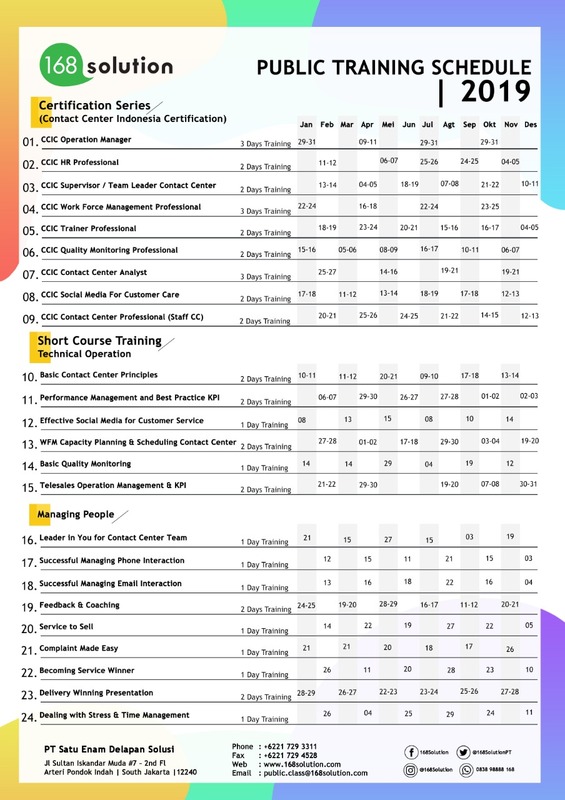 Initially it was difficult for me to find a call center training servce that does not only present theories but can also train by giving real applicable operation examples and cases, especially in the fast-paced telecommunication industry. All that changed when I met Grace and her team at 168Solution. With her years of hands-on experience in managing contact centers in the telecommunication industry, all the challenges are answered with practical solutions. During her training sessions, in addition to call center knowledge, practical tips and solutions to increase operational effectiveness and efficiency were also presented. Grace really adds value on training topics by using real examples on how one parameter affects others, and on how they ultimately affect customer satisfaction. At 168Solution's training sessions, Operations, People, Systems, Strategies are seamlessly and clearly presented. Thank you 168Solution, and my best wishes for continuous success.